Priced at $49,995 the CloudTMS machine is FDA cleared for the treatment of Major Depressive Disorder. Lease to own your FDA cleared rTMS machine for as low as $900/month. Hands on courses included. Designed to run quiet with a cooled angulated figure-8 coil enabling more focal targeting of the dorsolateral prefrontal cortex. Simply set frequency, time on, time off, session duration, and press Play to start treatment or Pause to make adjustments. The device's handheld stimulator coil can also be used to establish motor threshold, before locking in place over the treatment area to begin therapeutic stimulation. No special rooms or power equipment necessary, simply plug the machine into any standard wall outlet and power on. Advanced therapeutic configuration of our CloudTMS device covers all clinical needs of rTMS practitioners. 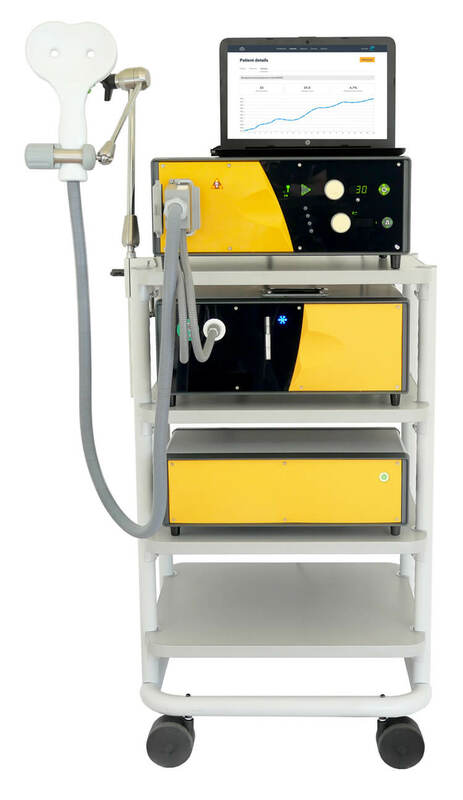 Including the control unit, cooling unit, booster unit, trolley, figure eight stimulator with stainless steel articulating arm for easy positioning, and laptop. Due to efficient liquid cooling our TMS device can run continuously all day without any pauses in operation. No need to power down and wait for the device to cool. Experience rTMS in a 21st century setting with secure access to your TMS practice data on the go and from any Internet connected device. Our handheld stimilator coils are guaranteed to run up to 20 million pulses and our modular design ensures maximum uptime of your device. In standard practice our devices typically run for years before requiring maintenance. Our FDA cleared CloudTMS device comes with the best cooling technology on the market keeping our coils cool even during long continuous use times.